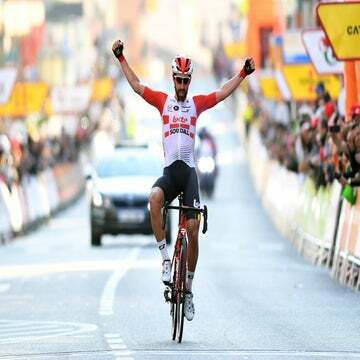 Riders increasingly seeking release from season's pressure of "too much Strava records, too much training, and too much focus on racing"
Lotto-Soudal’s Thomas De Gendt and Tim Wellens wanted to take the slow road home after racing the Il Lombardia on Saturday. The two WorldTour pros crossed the Alps and the Ardennes. Now they’ve just arrived back to Belgium. An early start Friday before dawn put them on the final 200km push to arrive to De Gendt’s hometown in time for the weekend. The five-day, 1,000km excursion is the latest in what appears to be a budding trend across the elite ranks. Riders inside the highly tuned and under-stress peloton are searching for something more authentic than the pressure cooker of professional racing. Just call it the soul tour. Other recent iterations of the trend include Larry Warbasse and Conor Dunne who went on a self-described “No Go Tour” this summer in the wake of Aqua Blue’s collapse. The pair rode across the French Alps for a week on a trip that captured the imagination of fans across social media. Some might wonder why professional bike racers would head out onto real roads with real traffic without support of mechanics, soigneurs and road closures, but it’s one more example of how social media and cycling’s changing ethos is sweeping across the pro ranks. Trends across the cycling industry as a whole seem to be nudging away from elite pro racing and more into experiential events of gran fondos, bike-packing, and gravel riding. With professional racing becoming much more data-driven, the pushback sees many embracing more soulful cycling adventures. Then, the pro riders use their platforms on social media to share stories, photos, and more. Italian pro Daniel Oss (Bora-Hansgrohe) has also been exploring the genre with his “Just Ride” series, hitting Italian back-roads in a mix of adventure and training. The ultimate bike-wandering experience was the “Thereabouts” project involving Dimension Data pro Lachlan Morton and his brother. In a series of three films starting in 2013, the brothers rode across Australia, the U.S. western deserts and the jungles of Colombia. That ethos seems to be fully embraced by EF Education First-Drapac and the arrival of Rapha, which returns to the WorldTour for 2019. Based in part on an in-depth study of how to best invest in bike racing, Rapha will be encouraging its ace WorldTour racers to compete in what’s called an “alternative” racing calendar that will include such non-traditional events as the Leadville Trail 100 MTB, Dirty Kanza 200, and the Transcontinental endurance race. For De Gendt, who is renowned for his long-distance breakaway acumen, he’s been thinking about doing something like this all spring. The Final Breakaway closed out a long season of racing. Wellens, a Belgian who lives in Monaco, decided to go along for the ride. The route back from Lombardia to Belgium took them over the Swiss Alps and the Vosges in eastern France, then across Luxembourg and Belgium, with a detour into Germany in what the pair said was to pay homage to German pro teammates Marcel Sieberg and André Greipel. They linked up with teammates Lars Bak and Maxime Monfort for dinners along the way. The roughly 1,000km trip was divided into six days of riding, but they made it back home a day earlier than expected. The pair decked out their Ridley pro bikes with Apidura travel bags, one on the handlebars, another on the top tube and with a rear saddle bag. Each evening they’ve been posting photos on social media of themselves gorging on pizzas, Haribo candies, cakes, soft drinks and beer, the stuff of mere mortals. It’s all for fun now. The intensity of racing and the obsession with numbers and results will return soon enough.